Kids Like Us by Hilary Reyl is a gorgeous story set in France about bookworms, French bakeries, and autism. There was so much to love while reading it and it was super easy to be immersed in the detailed setting, so it wasn’t like reading a book — more like living in it. Plus the narrator, Martin, is an utter book lover and how relatable is that?! The story is about Martin who’s living abroad in France for a while as his mother directs a film. He’s supposed to go to school and just enjoy the culture and life there, but things are complicated since change is very hard for him. Martin’s on the autism spectrum and his greatest focus in life is a super old book that he’s obsessed with. Even when he attends the local high school, he meets a girl who he thinks is straight out of his novel…although of course she isn’t so this is a bit of a problem. It’s a story of accepting differences and realising there’s no “one way” to exist and lead a good life. I really enjoyed the French setting! I’ve always wanted to see France (Paris specifically) for no really good reason, just shh, I’d like to go. The book totally captures the magic of a small French town, with bakeries and gardens and little cottages. I also believe the author has lived in France, so you could really see the authenticity shining through in the writing. Plus it actually delved into talking about the differences in learning to speak “classroom French” to actually being out and about with local people and discovering the slang and mannerisms. Martin is a fantastically admirable and relatable character. He’s adorable and winning and extremely thoughtful, and, bonus! He loves to cook! He enjoyed preparing complex meals with lots of different ingredients and one of his top favourite things was staring into the bakery windows at the delicately made madeleine cakes. So so with you there, Martin. I would like 1 or 9 of them too. And the foodie descriptions?! There was all this rhubarb jam and croissants! Actually I take it all back. This is a huge problem. I ended the book so hungry! I did love his infatuation with this old French book, In Search of Lost Time, although when he started to make references to it, I got a bit lost since I hadn’t read the book. But the bookworm love really shines through, and what’s more relatable to us readers, right?! I also appreciated the autism representation! It was really accurately written and lovingly done. Stereotypes weren’t misused and Martin was complex and deep and really leapt off the page. Plus I loved the inclusion of echolalia, which is a common autism trait but not one I’ve ever seen in books until now. This book wasn’t interested in writing a caricature or making fun of any aspects of autism — it was so respectfully done. 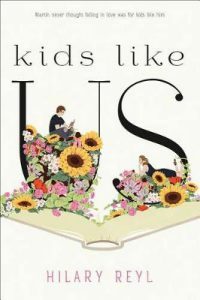 Kids Like Us is a fantastic and beautifully told story that explores autism and what it is to accept yourself. Definite must read! Oh wow, this sounds wonderful – love your comment about ‘the bookworm love’ shining through. Also such a relief to hear of the quality character development, no misuse of stereotypes. I do not often read YA but this is going on my wishlist.